All your favourite zoo animals in one mad zoo chase caper. We love the expressive art and the wacky rhymes too. Why should you never shout in a zoo? Well: you might scare the bears, or the hippos and lions – and they’ll chase you! Then what will you do? That’s what happens when one little shout from one little girl snowballs and causes chaos at the zoo. But will she learn her lesson? 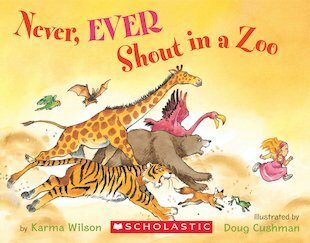 Karma Wilson – the creator of Bear – brings a friendly stampede of animals to life in this cheerful favourite.